Congressman Francis Rooney wants the U.S. Army Corps of Engineers to find a solution to the toxic algae that's growing in places Lake Okeechobee and the Calooshatchee River. 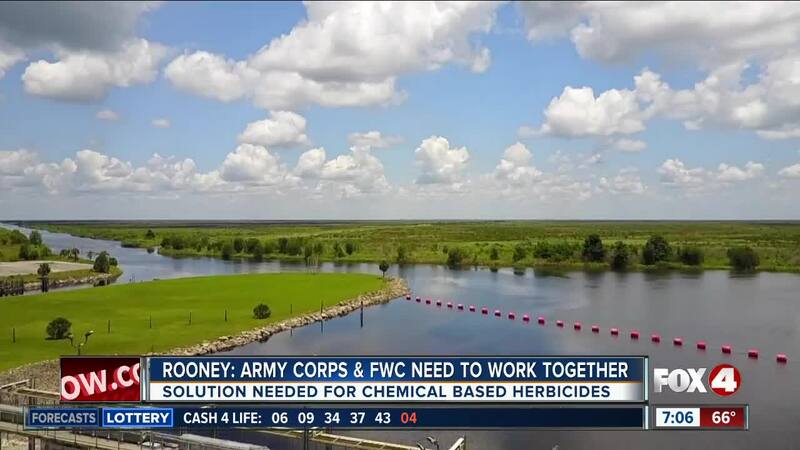 LEE COUNTY, Fla. -- Congressman Francis Rooney wants the U.S. Army Corps of Engineers to find a solution to the toxic algae that's growing in places Lake Okeechobee and the Calooshatchee River. Here's the problem: to manage invasive plants, Florida Fish and Wildlife sprays herbicides into the water. But a lot of them have phosphorous, which turns algae toxic and helps it to grow. So Congressman Rooney wants the Army Corps to work with FWC to find better ways to manage invasive plants. “In 2018, Florida’s waterways were afflicted with a serious outbreak of toxic algae which at its height, according to NOAA, covered nearly 90% of Lake Okeechobee. These HABs flow into the waterways and wreak havoc on our communities causing not only environmental damages, but also economic and health hazards. This ongoing issue has been affecting Florida for decades. We must seek solutions to the contributing factors, both large and small, that are feeding into the epidemic,” said Rooney in a statement Thursday. For now, FWC has stopped using chemical based herbicides.